Since the new school year is approaching near for most students, it’s important to be prepared in order for your child to have a successful school year. For students with celiac disease, this can be an added stress when facing a new school year. Many parents prepare their gluten free children by packing their lunch, educating them on the importance of avoiding gluten and speaking with their teachers. However, sometimes this just isn’t enough. Some of you may know that professionally I’m a Behavior Analyst and my primary area of focus is autism, however my background is education and I have a Master’s degree in School Counseling, so 504 Plans are something I personally have experience with. Did you know getting a 504 Plan can help ensure a gluten free environment at school for your child with celiac disease? Basically to put this definition in simpler terms, a 504 Plan is a legally binding document detailing any and all accommodations that need to be made by the school in order to assure a student with a disability (pre-school through college) receives an appropriate education. Section 504(a) of the Rehabilitation Act of 1973 prohibits discrimination in all institutions receiving federal financial assistance (including schools) on the basis of disability, including certain diseases. Does celiac qualify for a 504 Plan? Yes! Celiac disease is considered a disability under the Americans with Disabilities Act. The Americans with Disabilities Act was amended in 2008 to include eating as a major life activity. 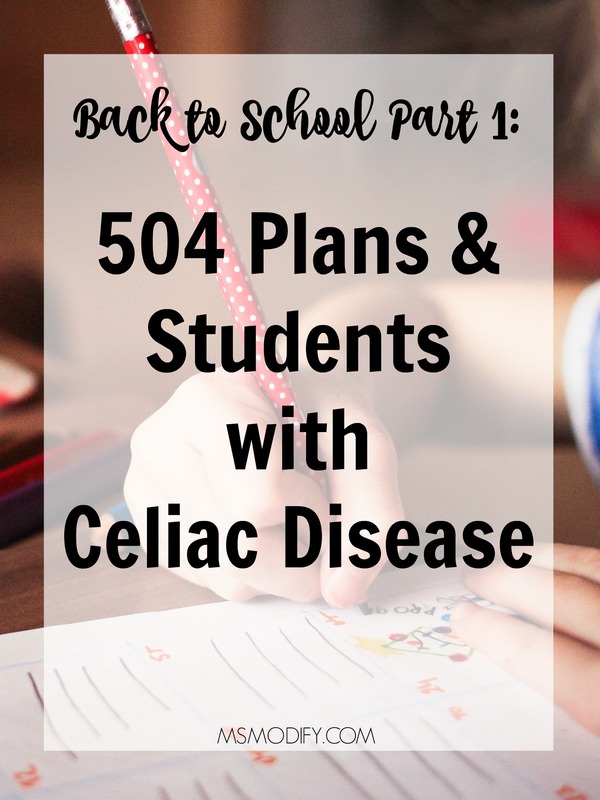 Why would you want a 504 Plan for your student with celiac? A 504 Plan will clearly state which accommodations will legally need to be made in order to safely attend school and participate in activities. Having this plan can help eliminate any confusion on what needs to happen. What will a 504 Plan provide to students with celiac? *These are just some samples, it could vary student to student. Educate yourself on exactly what they are and how it will help your child. This will help you to advocate for your child. Request a letter from your child’s doctor about their celiac diagnosis and required gluten free diet. Find out who the 504 coordinator is at school (this could be various school personnel) and schedule a meeting. The first meeting may just be with the coordinator to discuss the process. At the second meeting when the plan is written, ask for all teachers that will interact with your child to be present so everyone is on the same page. Make copies of the plan! Do all students with celiac need a 504 Plan? This is completely up to families to decide what is best for their student. My biggest recommendation is to have open communication with your child’s teachers and other school staff from day one. I hope you found this information helpful and hope your kiddos all have a wonderful time back at school! This entry was posted in celiac disease, Lifestyle and tagged 504 plan, celiac kids, celiac tips, Kids, school.